The Men’s Basketball team lost a tough home game to Boston College on Saturday, going scoreless in the final four and a half minutes en route to a 65-61 defeat. With the loss, Wake Forest dropped to 8-11 on the season and 1-6 in conference play. Senior Torry Johnson was out for the Deacs with a shoulder injury, and a knee issue held freshman guard Wynston Tabbs out for the Eagles. He is their third-leading scorer, averaging 13.9 points per game. “Boston College got off to a too comfortable start,” Head Coach Danny Manning said during the post-game press conference. The Eagles opened the game on an 8-0 run. The 9,487 fans in attendance were very quiet during the first few minutes of the first half, except for the loud sighs and groans promoted by the frustrating amount of near misses by the Deacs. Wake Forest got on the board with a layup from Chaundee Brown a little under four minutes into the game. The evenly-matched teams battled closely the rest of the half, but a 10-0 spurt across five minutes gave Wake Forest a 33-27 lead. The run was highlighted by an Olivier Sarr dunk off a nice wrap around pass by Jaylen Hoard. At halftime, the Deacons lead was 35-31. The second half was close throughout, as the largest lead by either team was when the Deacs lead 38-31 after a three from Hoard. The Coliseum erupted after a fast break layup by Sharone Wright, Jr. that gave the Deacs a 52-48 lead with just under 10 minutes remaining, but a timeout by BC Head Coach Jim Christian settled down the crowd. A corner three by Isaiah Mucius one minute later got the fans energized again, but Christian smartly used another timeout to halt Wake from feeding off the momentum and putting together a run. 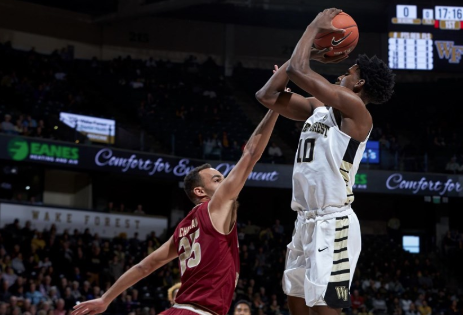 The Deacs led 61-56 after a second chance layup by Hoard with four and a half minutes remaining, which was the last time they would see the ball go through the net. The game was tied at 61 for over two minutes, but with 15 seconds remaining, Boston College’s Ky Bowman hit an off-balance three at the end of the shot clock which turned out to be the game winner. Hoard played a great game for the Deacs, scoring 22 points on 9-13 shooting to go along with 11 rebounds. However, he was only able to get off one shot during the team’s scoreless stretch at the end of the game. “We would like for him to be a little bit more assertive, certainly in moments like that, but I thought he made some smart plays in terms of passing the ball when a crowd came around him,” Manning said. “At the end of the day we turned the ball over far too many times,” Manning said. The Deacs had 16 turnovers, compared to just seven for the Eagles.